Two eagerly-awaited events crashed into our weary shared consciousness this week. 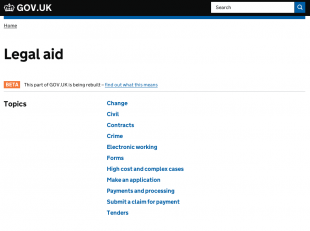 Not only did Kate Bush return to the stage after 35 years (mmm, yes) but the Legal Aid Agency online content transitioned to GOV.UK. Over 3-4 months, captained by Martin Oliver, writers Helen Cleary and Jane Stead bathed briefly in the legal aid system before diving into the work head-first. Countless meetings, emails, cups of tea, fact-checks and inexhaustible patience from both the Legal Aid Agency (LAA) and the MOJ DS content team ensued. The product? A lighter, simpler and, so far, well-received agency site. About 20-30,000 words (the average novel is 70-80,000) were then fact-checked, amended, then fact-checked again by a variety of responsive and forbearing LAA subject matter experts’ (SMEs). Kap Ling was unfailingly proficient in smoothing this potentially rocky process. This new body of language was further style-checked, proofread, published, tagged, and then, after over 4000 url re-directs, was finally launched. Striking a balance between the stark new GOV.UK language style and the existing meticulous and comprehensive language of the law was an ongoing challenge. We were continually conscious of the content not jolting between one style and the other. Another ongoing concern was softening the impact of this website transition to what, we know, is many law providers’ daily port of call. But the writing of user journeys at the start of the process has meant the site should now be much easier to navigate. Having launched almost a week ago, we’ve been closely monitoring any feedback, armed and at the ready to jump in and correct expected errors. But so far all feedback has been good with few errors reported. Over the next few weeks, the site will be handed back to MOJ Comms and LAA for general maintenance and updating. Of course, in retrospect, certain things could’ve been done differently, but the untrodden path with eyes wide open is always the most stimulating: a good result is its own reward.